These essays explore the many ways theater and dramaturgy are used to shape the everyday experience of people in mass societies. Young argues that technologies combine with the world of art, music, and cinema to shape consciousness as a commodity and to fragment social relations in the market as well as in religion and politics. He sees the central problem of post-modern society as how to live in a world constructed by human beings without nihilism on the one hand or repressive dogmatism on the other. Young argues that in advanced monopoly capitalism, dramaturgy has replaced coercion as the management tool of choice for the control of consumers, workers, voters and state functionaries. Young calls this process the "colonization of desire." Desire is colonized by the use of dramaturgy, mass media, and the various forms of art in order to generate consumers, vesting desire in ownership and display rather than in interpersonal relationships with profound consequence for marriage, kinship, friendship and community. While Young focuses his critique on capitalist societies undergoing great changes, he insists that the same developments are to be found in bureaucratically organized socialist societies. 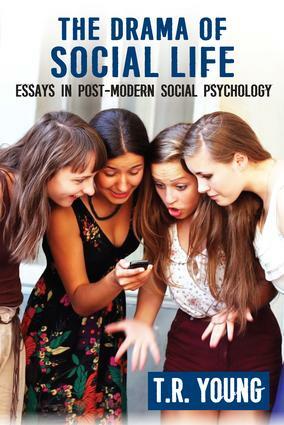 The Drama of Social Life is of interest to those who study theories of moral development, cultural studies, the uses of leisure, politics, or simply the uses of "make believe." It is intended for the informed lay public as much as for social psychologists.